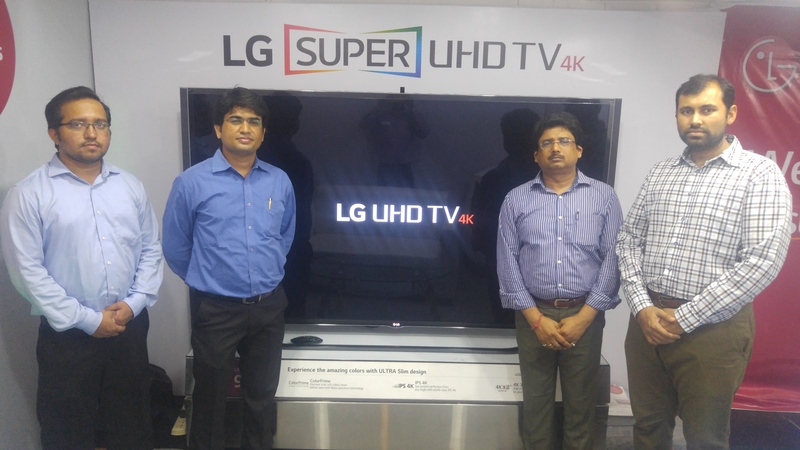 A K Gandhi, the leading electronics store of central India, and a pioneer in Home Electronics and Appliances in association with LG have launched the LG Ultra HD TV 4K carnival. In this carnival, widest range of 4K LEDs are on display, starting from size of 40 going up to 79. The star attraction of the carnival is the live display of the largest 4K UHD LED, 200cm (79). Special 4K UHD Zone has been created and the highlight of the zone is the LG 79UB980T with gigantic screen size of 200cm (79) with 4K UHD picture quality. A K Gandhi has been a pioneer in launching latest and best electronic products. LG 4K ULTRA HD presents a whole new level of picture quality, boasting a resolution four times higher than Full HD. Naturally, it is incredibly vivid and crisp, even when viewed from close distances. It will thoroughly satisfy the viewer with flawless detail, lifting the standard of visual display yet higher. With IPS 4K Panel offers the most identical color impression to that of the original image in every precise pixel of ULTRA HD resolution. IPS 4K Panel shows the most consistent color and contrast from all angles among competing panels, so you can enjoy more professional-grade color from every seat in your house. IPS 4K Panel is superior to conventional panels in picture clarity in fast motion scenes. That means you can now enjoy action movies and sports with blur-free & crystal-clear quality. It also boasts of other interesting features like the world’s most comfortable 3D. It is also the sharpest 3D in 4K resolution. With its quadrupled resolution, the 3D images are more splendid than ever and the realism more lively than ever. Enjoy 3D movies on a large screen at home, just like at the movies. Even the large screens of LG ULTRA HD TV provide flicker-free, comfortable images that make the 3D entertainment more enjoyable. LG ULTRA HD TV delivers bright and beautiful pictures, even in 3D. Even Full HD 3D movies can be upgraded to be played on LG ULTRA HD TV by automatically up scaling 3D movies close to 4K quality. True 4K Engine Pro is a more powerful engine especially for the model. True 4K Engine Pro can create vivid 4K pictures and the sophisticated algorithm of the engine brings low resolution images much closer to 4K quality. LG ULTRA HD TV with its powerful engine will thoroughly satisfy the viewer with its flawless detail, lifting the standard of visual display yet higher. A K Gandhi and LG, invites all its esteemed customers, to experience the thrill of viewing content on a 4K UHD LED TV at the 4K Ultra HDTV Carnival. Experience the true 4K Ultra HD experience at the LG 4k Ultra HD Zone, in all available sizes beginning from 40 and going up to largest screen of 200cm (79).